The FEISOL LB-7572 Leveling Base provides up to 30° of adjustment to your existing FEISOL Elite CT-3372/3472 tripod. 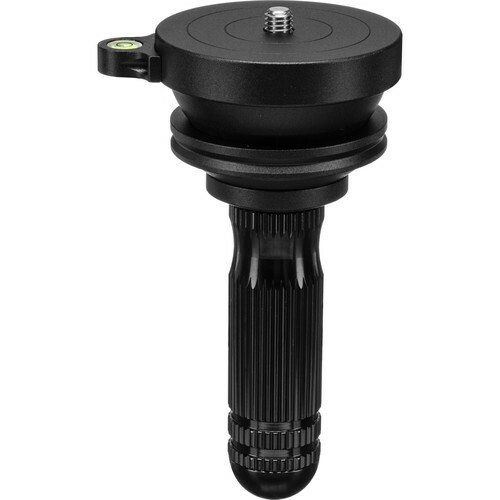 The base allows you to level the mounting platform of your tripod without having to make minute adjustments with the legs, and only adds 1.2" to the height of your tripod. You can quickly exchange your tripod's standard mounting plate for the leveling base. The leveling base provides a 3.1" mounting platform with a 3/8" mounting screw. Featuring an integrated bubble level for accuracy, the base is machined from solid aluminum alloy and anodized for corrosion and wear resistance. Box Dimensions (LxWxH) 7.4 x 5.0 x 4.6"
LB-7572 Leveling Base is rated 3.3 out of 5 by 4. Rated 5 out of 5 by david from A Nice Add On! I ball park my initial tripod set up and then quickly fine tune with this base which has its' own leveling bubble! I do not like extending a center column at all,particularly with big lenses,so this really works for me! Rated 5 out of 5 by Gene R from Works as expected Purchased this leveller for my CT-3472. Usual high-quality Feisol product. Easy to install and use. More than adequate adjustment movement to meet my needs. Rated 1 out of 5 by Mike from Not adjustable to 30 degrees I am only seeing maybe 10 or 12 degrees of adjustment using this with my CT-3472LV. Rated 2 out of 5 by Richard from Not as Expected Installed on my new Feisol tripod with my ball head. The tensioning handle operates awkwardly in the center of the tripod. Tightening the handle with enough pressure is difficult. After tightening it with what you think is sufficient force the bowl can still move. I love the new tripod but I believe this base needs re engineered. This product description claims 30 degrees of correction in any direction. Is it truly 30 degrees in any direction or is it +/- 15 degrees? It is certainly not 30 degrees of correction from level --- it doesn't seem to be even 15 degrees from level. But it may be a math issue in how it is measured. Perhaps from side to side might be more but I would be surprised if it is 30 degrees even from side to side. How long is this going to be on back order? The description said 7-14 days about 14 days ago! Our incoming shipment was delayed slightly because of the holidays - it is scheduled to come in right after New Years - sorry about the wait! What diameter is the plate? The mount diameter of the LB-7572 is 80mm.